The rocket consists of 2 stages, first is made of 4 engines (A block) with oxygenated kerosene laid out on the side of the central block. The second stage is the central block (Ц block) which is propelled with a mixture of hydrogen and liquid oxygen (propellant), the payload is laid out asymmetrically on it. Thanks to its general-purpose configuration Energia is able to put into low orbit with the Buran shuttle or of another structures (Polyus...) large-sized loads and a mass going up to 100 t. The major difference between Energia and the American launcher lie in the fact that the central block is not a fuel tank for the shuttle's engines but a entire stage and thus the payload does not have any role in orbiting. This is why the American launcher cannot fly without its shuttle and its powerful SSME engines. The starting mass of the rocket reach 2400 t. Each block of the first stage supplies a ЖРД РД-170 engine, composed of 4 nozzles, out of liquid oxygen and hydrocarbonated fuel. The thrust of the engine of the first stage makes nearly 740 t on the ground and 806 t in vacuum. The second stage is driven by 4 ЖРД РД-0120 engines, whose thrust are 148 t each one on the ground and 200 t in vacuum, functioning with a mixture of oxygen and liquid hydrogen (oxygen is cooled at -186°C and hydrogen at -255°C). The total thrust during the flight is 3550 t. Engines ЖРД РД-170 especially worked out for Energia and used for the first time on "Zenith" ("Зенит") are extremely powerful and do not have an abroad equivalent. The blocks of the first stage are ejected in couple from the launcher after having consumed their fuel at 140 s from the ignition, an altitude of 53 km and a speed of 1.8 km/s. Then 15-25 s later they separate individually and 8 min after land in an area located at 426 km of the launch pad. Each block can be equipped with parachutes and retrorockets which settle in the 2 containers parts (in top and bottom) to soften the landing and to allow their re-use. There was a project which envisaged to equip the blocks with retractable wings and automatic landers to enable them to make a self-directed descent and a landing on a runway. The blocks of the first stage are envisaged to be re-used 10 times, the machines and systems of flights 15 times, the engines 27 times. In the first flights the blocks were not equipped with parachutes nor of retrorocket, because the monitoring equipment was installed there. The central block (second stage) separates 480 s after the launch at an altitude of 115 km, and fall to the antipodes from the starting point, in the Pacific Ocean. Such a scenario excluded the contamination of the low orbits of the ground by the remains of the launchers (which would spend several days or month before disintegrating in the dense layers of the atmosphere). The end of the orbiting phase is dealt with by the engines of Buran or the engines of the block containing the payload which have a 3 td stage function. Blocks of the rocket "Waterspout" and "Vesuvius" ("Смерч" and the "Везувий") were supposed to be used as 3 td stage. 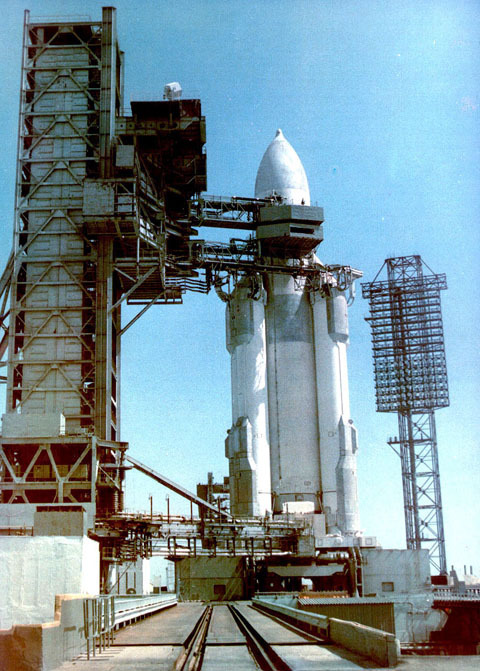 Thus, in this configuration Energia was able to put into geostationary orbit loads going up to 18 t, for a trajectory towards the Moon 32 t, and for Mars or Venus 28 t. Other projects envisaged the use of Energia to send loads from 5 to 6 t towards the Sun or Jupiter. The safety and the viability of Energia are important points of the requirements, this is why a special program is in charge of the validation of the work done on the experimental and tests installations. All the vital parts of the rocket are doubled, including the operation engines, the conduits actuators, the pumps, the power supplies and the explosives. 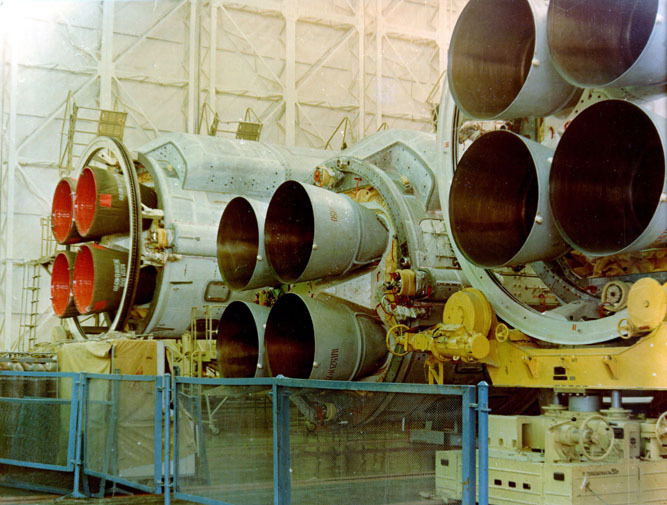 The rocket is equipped with a diagnosis system of engines's breakdowns or separation system which makes it possible to the on-board computer of Buran "to take a decision" to minimize the loss of the payload or the crew. Thus, the driving software takes into account nearly 500 alternatives situations of accidents and their parades.